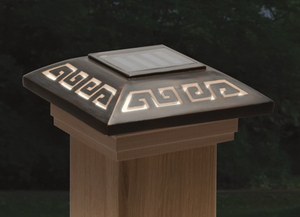 Captivate passersby and onlookers and improve the lighting conditions of your gardens, fences, railings, lawns, or yards at night with the Labyrinth Designer Post Cap Light. Q: What are the inside dimensions of the Labyrinth Designer Post Cap Light? Q: What kind of bulb does it carry? A: This solar post light is equipped with a 1-watt LED bulb. Q: Can I install it by myself? A: Yes you can. Due to the absence of wiring, you can easily set up this decorative solar light for fences, railings, gardens, lawns, yards and other outdoor areas on 4x4 posts. Q: Is it covered by a warranty? A: Yes, the Labyrinth Designer Post Cap Light is covered by a 2-year limited warranty on materials and workmanship / 1-year limited warranty on solar light components (solar panel, low voltage solar cell and LED light bulb). So far, it is working very will. ProsIt proved to be very adaptable for what I had in mind as far as mounting it on a non 4 x 4 fence pillar. Best UsesIt is working properly since I installed it.